Concerto in G major, 1st mov. Enjoy playing Telemann's Concerto in G major (1st movement) for viola and piano accompanied by concert pianist, Lisa Maresch. 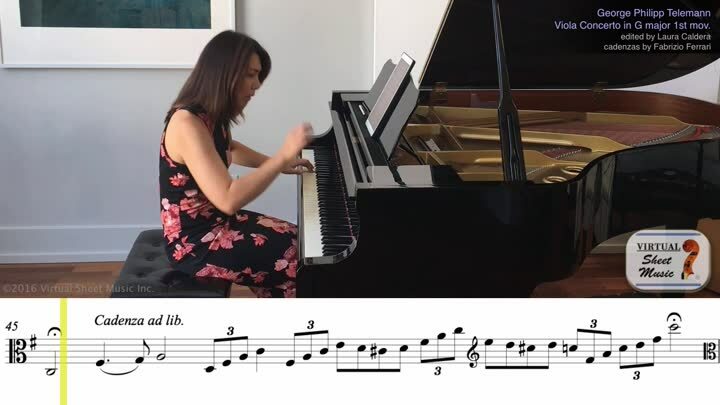 Thanks to our unique interactive video player, you can easily speed up and slow down the tempo of the piano accompaniment audio/video track, set up loops and markings - all while reading your violin part from the same video. A useful tool for any musician. I am interested but will wait for all four movements. Well, this is just the first video of the concerto, we'll work on the rest soon. Our priority is to provide top quality for each video, and that takes a lot of work, takes, and time. So, way wait to release the entire concerto when the first movement is already available? Thank you again for your kind feedback and, please, keep suggestions and questions coming!